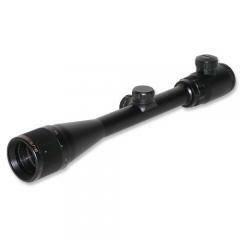 Bushnell 714164I Banner 4-16x40 IR Reticle Riflescope 714164I FREE SHIPPING! This Banner series variable power riflescope from Bushnell provides exceptional performance in low light conditions at a wide variety of ranges. Its premium optical system features advanced Dawn & Dusk Brightness multi-coatings that maximize brightness and clarity in the early morning and late evening. Its fast-focus eyepiece allows you to quickly lock on to your target at any distance, while the fingertip adjustable, resettable windage and elevation controls provide pinpoint accuracy even at extreme distances. The durable one piece tube design resists shocks effectively. It is also O-ring sealed and nitrogen filled, making it completely waterproof and fogproof for all-weather use. ©2002-2019 CopsPlus.com: Bushnell 714164I Banner 4-16x40 IR Reticle Riflescope 714164I FREE SHIPPING!